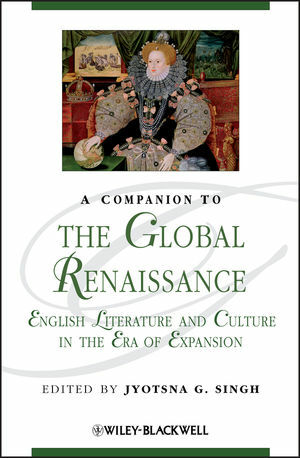 Featuring twenty one newly-commissioned essays, A Companion to the Global Renaissance: English Literature and Culture in the Era of Expansion demonstrates how today's globalization is the result of a complex and lengthy historical process that had its roots in England's mercantile and cross-cultural interactions of the sixteenth and seventeenth centuries. An innovative collection that interrogates the global paradigm of our period and offers a new history of globalization by exploring its influences on English culture and literature of the early modern period. Moves beyond traditional notions of Renaissance history mainly as a revival of antiquity and presents a new perspective on England's mercantile and cross-cultural interactions with the New and Old Worlds of the Americas, Africa, and the East, as well with Northern Europe. Jyotsna G. Singh is a Professor at Michigan State University, where she teaches early modern literature and culture, post-colonial theory, and gender and race studies. Her published works include Colonial Narratives/Cultural Dialogues: 'Discovery' of India in the Language of Colonialism (1996); The Weyward Sisters: Shakespeare and Feminist Politics (co-authored, with Dympna Callaghan and Lorraine Helms, 1994); and Travel Knowledge: European 'Discoveries' in the Early Modern Period (co-edited with Ivo Kamps, 2001). She has received several research fellowships, including at the Folger Shakespeare Library and Queen Mary, University of London.